33.Siva as teacher of attamacitti (eight magical powers). 34. Siva cuts open a new gateway through city walls. Iracentira crowned Pandya king. 35. Sundara becomes water carrier to serve water to thirsty Pandya troops who are engaged in battle with the Chola army. 36. To fulfill the wish of a pious temple-girl, Siva becomes an alchemist so that she can have Siva’s idol cast and consecrated. 37. To save Cunterca Patacekara pantiya from invading Cholas, Sundara fights in battle and drives with his spear the Chola to grave in the lake. 38. Siva gives a never failing bag to Atiyyarkku Nallar, devotee who spent his wealth feeding Siva’s bakthas. 39. Sundara in the guise of maternal uncle settles a dispute about succession to property. 40. To atone for the sin of having killed unwittingly a brahmin and cast out the ghost which had possesed him, Varakuna Pantiya, on Siva’s advice, pursues the Chola who dared march on Maturai. 41. In response to appeal of Panapattira (bard Bhadra) to help him vanquish a rival bard, Siva appears as wood-cutter and sings a song which makes the rival (a North Indian names Emanatan) run for it. 42. Siva sends Pattiran the bard with a message to Chera king. 43. Siva gives Pattiran a bard on which to stand while singing Siva’s praises. 44. Siva makes king Iracaraca Pantiya award the prize to Pattiran’s wife in a musical contest, though the king arranged the contest to spite himself against the bard and his wife. 45. Dozen sons of Vellala Cukalan and his wife were born thorugh a curse as pups to a boar and a sow. 46. Through his grace the pups are agian born as humans, are brought up on the boar hill (panrimalai) and become the king’s ministers. 47. Siva teaches a blackbird the mrtyumjayamantra (powerful spell against death given to Markandeya when Yama wanted to kill him). 48.How through piety a crane forswore fish and starved, and how Siva vouchsafed salvation to it and all its kind. 49. A brahmakalpa comes to end and dissolution. New age dawns and Vankiyacekara Pantiya raises a city round Sundaresvara’s temple and appeals to Siva to discover for him the ancient city limits.A serpent winds itself round city boundaries and the city becomes known as Alavay (lit.”[having] poison in mouth”), i.e city encircled by coiled snake. 50. Vikarama Chola,assisted by Northern kings,attacks the city. Siva appears as archer and drives the attacker away. 51.While Brahma was on his way to bathe in the Ganga, Sarasvati lingered behind and came late. Brahma told her she must take on 48 bodies (symbols of devanagarsi script). the letters beacame men, reached Pandya land, adored Siva’s feet and established an Academy (Cankam). Sundara gave them a board on which to sit; it was first mounted by –> Nakkirar, then by Kapilar, then by –> Paranar.Each of the 48 academicians composed wonderful poetry, but the poems resembled each other so much that the poets could not recognize their own works. Sundara sorted them out and became president of the academy (now 49 in membership). 52.next king, vankiya Cutamani, walked with his queen in the garden, and the breeze brought him the fragrance of her tresses. The king offered a purse of 1000 gold pieces to whoever could answer this question; Is the fragrance independent of the scents and blossoms in her hair or not? A saiva Brahmin, taurmi, was so poor that he could not even marry. Siva composed a poem (–> kurunthokai 2 by –> Iraiyanar, i.e. “the lord”) and gave it to tarumi as an answer to the king’s question. nakkirar declared that the poem was incorrect. he stubbornly maintained that if a head of hair was not properly washed and dressed it would emit foul smell. This could apply even to hair of goddesses.What about the consort of Siva, asked the god in disguise. Nakkirar remained firm. When Sundara revealedhis identity by opening his blazing third eye. Nakkirar gave the famous reply:”Though all your body be covered by flaming eyes, a flaw remains a flaw!” then the threw himself into the temple pond (to estingusih the flames). Siva disappeared. 53. At intercession of other poets, Sundara and Minaksi went to the pond,Tarumi was given the purse. 54. 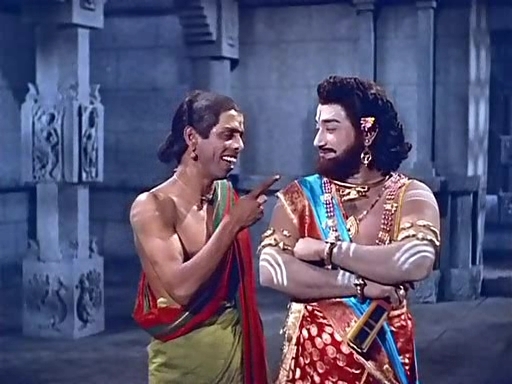 Sundara, pleases with Nakkirar’s character and devtion,sent him to Akatiyyar to improve his Tamil. Akattiyar taught Nakkirar Tamilto perfection. 55. The poets had disputes about the merit of their works, Sundara send them to a merchant who has handsome, intelligent, but mute son.The boy is chosen by Siva as adjudicator. Taken to the Academy seat, he approved or disapproved of the poems by nodding his head and hearing poems by Kapilar, Paranar and Nakkirar, shows great joy. 56. One of the Pandya Kinga insulted a poet who complained to Sundara saying that, since Siva is the Word and Minaksi the Meaning, the king in fact insulted the divine pair.The king was forgiven after praying for pardon. 57. While Siva is explaining Vedas to Minaksi, she is inattentive; hence she is cursed to be born as daughter of a fisherman.Murukan, who had thrown into the sea the–> Civananapotom snatching it away from Siva’s hand, is cursed to be born congenital mute and merchant’s son; Vinayaka is the only one spared (though he had thrown all books into the sea as the source of all troubles!). Siva then plies fish nets in the sea and takes the fisherman’s daughter as wife. 58. A brahmin boy is born in tiruvatavur. he becomes prime minister of king Arimarttana Pantiya. Sees Siva at Tiruperunturai and becomes his devotee as –> Manikkavacakar. 59. He turns over the money recieved from the king to buy horses to his guru Siva, but is thrown in prison and tortured. Siva transforms jackals into horses and takes them to the kind. 60. Manikkavacakar is restored to the king’s favour. The horses brecome jackals again. Manikkavackar is arrested and tortured but helped by Siva who causes river Vaiyai to overflow. 61. King appoints Manikkavackar to build a dam and thus save the city. While the dam is being built, Siva helps an old woman carry baskets of earth. King wants to restore manikkavackar to his post, but the saint refuses and goes to Tillai,wins arguments with Bhuddists, composes –> Tiruvacakam. 62.legends about Mircales worked by Siva through –> Tirunancampantar, e.g. King Kun Pantiya is cured of his hunched back, induced to forsake jainism and embrace Sivaism. 63. Nanacampantar vanquishes Jainas and has them impaled. 64. Nanacampantar resurrects a young man bitten by cobra, has him married is in doubt, Siva makes a tree, a well and a lingam appear as witness. In the Epilogue, the sages wish to visit Tiruvalavay and adore Sundaresvara. On their way, Agastya guides them through sacred Saivaite places, in maturai they worship and install themselves in Papovanam forest near the city. Thiruvilayadals in this color are feature in Thiruvilaydal movie starring Shivaji, Balaiah,T.R.Mahalingam, K.B.Sundarambal. 36. To fulfill the wish of a pious temple-girl, Siva becomes an alchemist so that she can have Siva’s idol cast and consecrated. – interesting would love to read more !! 47 – black bird – remember it as a crow! Kudos to your atttempt. It is very useful.